This week I interviewed Lauren from Just Add Lauren. She is a military wife and mom who enjoys sharing information on how to live green and healthy. Scroll down for my exclusive interview with Lauren. Lauren: I am originally from North Carolina, but my husband is in the military so we are nomads now! Lauren: I started blogging in early 2010. Lauren: I blog as a creative outlet and because it inspires me to constantly learn and challenge myself. 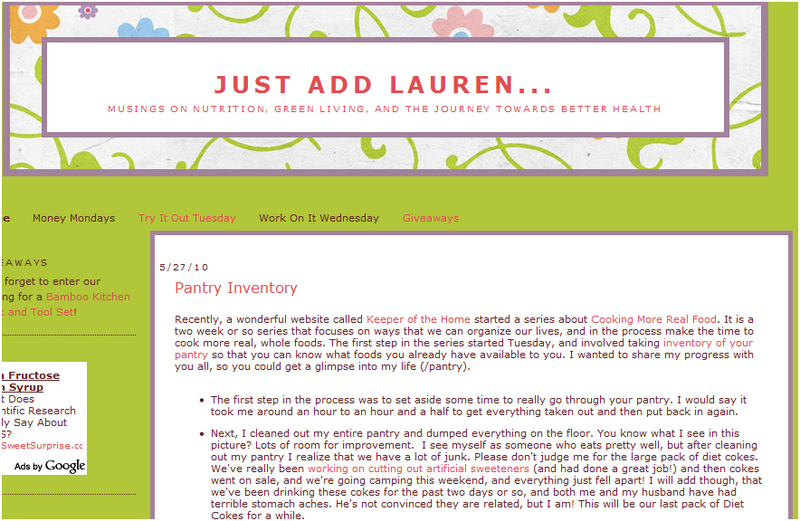 Lauren: Just Add Lauren is a blog mainly focused on health and wellness as it relates to organic and whole food eating and nutrition. I also like to throw in some budgeting tips (Money Mondays) and challenges for myself and my readers to make our lives more green and natural (Work On It Wednesday). Lauren: Ultimately I would like to create a sense of community where people can come to learn about organic foods and natural living. I would like to have interaction from my readers, so people can come and participate in ongoing discussions. Lauren: I want my readers to learn from my blog, as well as teach what they know. I would also like to be able to inspire people to move towards living and eating in more natural, green, organic ways. Lauren: I have a few series’ going on that I hope will bring readers back each week. I also have periodic giveaways. I feel like the best way to get readers to come back though, is to provide them with interesting and informative information. Lauren: Write about what you are passionate about. You won’t ever have a lack of topics if you are constantly writing about things that interest you. You can visit Lauren at Just Add Lauren. Great post! I will go and check out her blog..
Green is the very in thing to do. Glad there are more and more folks out there digging it.